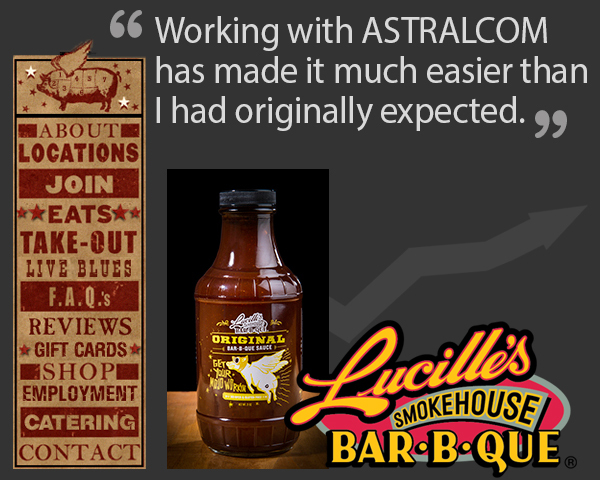 Lucille’s Smokehouse BBQ – Website and E-commerce Development | ASTRALCOM - Content Strategy, Conversion Marketing and Customer Acquisition. Lucille’s Smokehouse BBQ – Website and E-commerce Development | ASTRALCOM – Content Strategy, Conversion Marketing and Customer Acquisition. With an already established chain of successful and well known establishments, the creators of Hof’s Hut Restaurants created a new expansion chain and called it Lucille’s BBQ Restaurants. Lucille’s quickly grew into a regional chain and each one is packed with happy and hungry diners every night. The appetite for Lucille’s delicious BBQ sauce was in growing demand and Lucille’s decided it was time to sell their famous BBQ sauce and other unique items to the world at large. So, ASTRALCOM sat down with Lucille’s and mapped a process by which Lucille’s could easily begin to sell via the web. Creating an ultra user-friendly system was critical and so we cooked up a seamless e-commerce application and some unique content management solution (CMS) sides that enabled Lucille’s to launch and maintain a successful e-business. Want to grow your business empire, like Lucille’s? Contact us and we’ll make it happen for you, too.